Posted on Tuesday, March 18th, 2014 at 5:11 am by Pieter van der Westhuizen. Did you know that 5 million businesses use Google Apps? Were you also aware that users can create and edit both Word and Excel style documents and spreadsheets right inside their browsers? Google Apps provides a whole new set of opportunities for developers by enabling them to build web apps and automate tasks inside Google Apps using the Google Apps Script. I’ve spend some time delving into the Google Apps Script library and found I, as a Microsoft Office developer, was remarkably comfortable with the object model the Google Apps Script provides. In this article we’ll focus on how to create a Google Docs add-on and add your own functionality to it. It bore some resemblance to the Microsoft Office object model as some objects may seem very familiar to MS Office developers. 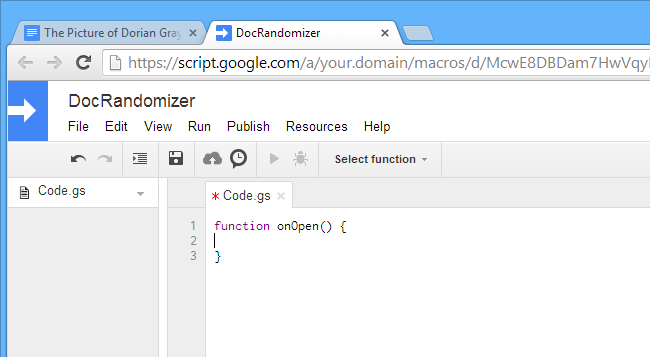 Before we can jump into exploring the Google Apps Script for Google Docs, let’s first create a new script. 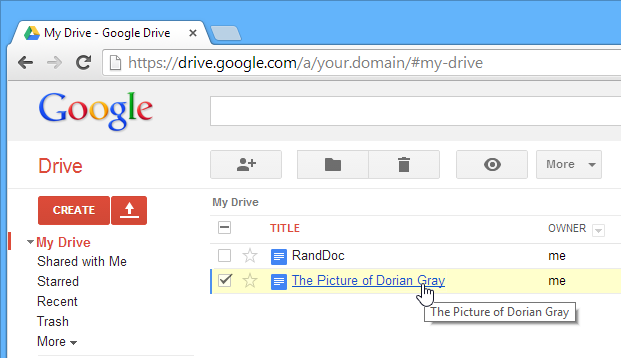 To do this, log into your Google Drive account and create a new document or open an already existing document. To open an existing document simply click on its name. The document will open in a new window and you’ll notice the traditional Word editing icons and functions such as font name, size and color as well as text alignment and justification, to name but a few. 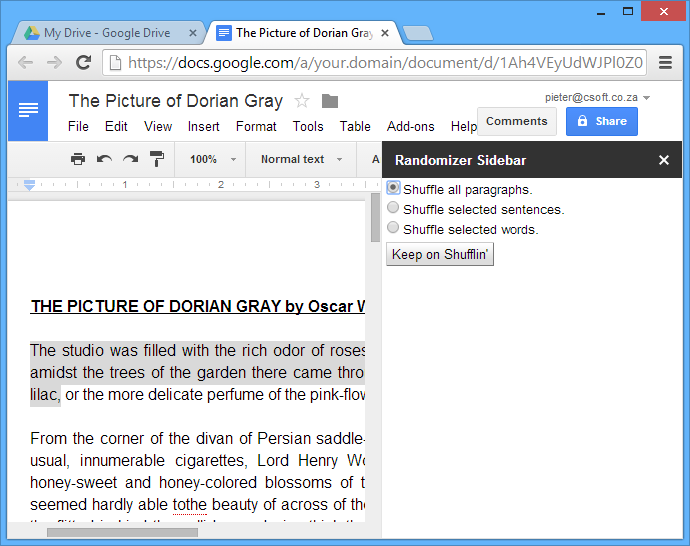 Next, we’ll create a script with which the user can choose various options to shuffle elements in the document. Create a new script by selecting Script editor… from the Tools menu. 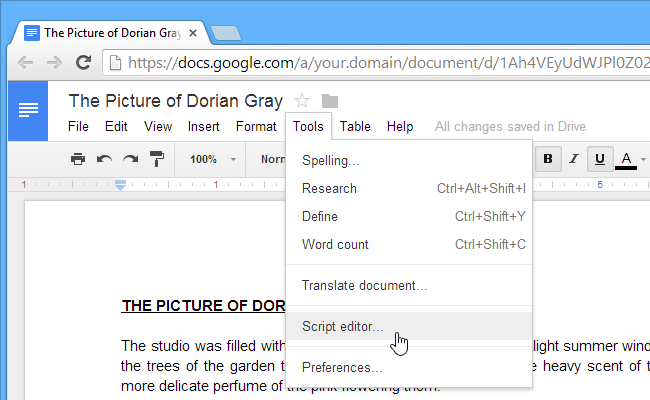 This will open a new script editor window, when prompted, select Document in the Create script for list. This will automatically create a file called Code.gs with a number of functions for you. For this example, remove all of them except for the onOpen function. It might be a good idea to save the example code if you want to explore other options later. 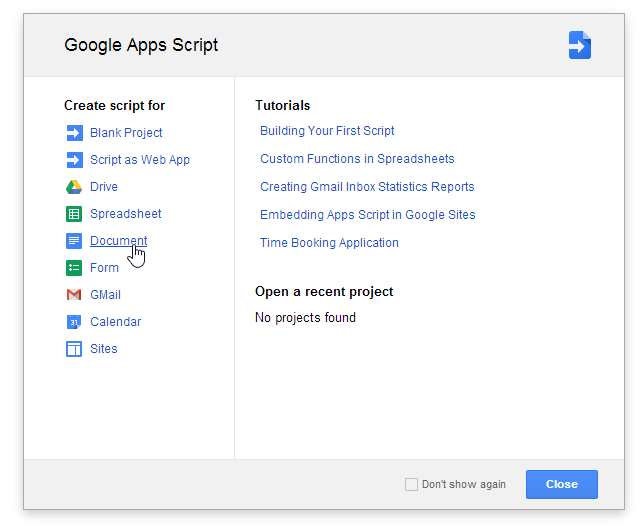 Google Apps Scripts provide the UI Service which developers can use to build user interfaces for their scripts. It allows you to add elements such as radio, push and toggle buttons as well as a variety of other UI elements. In this example, we’ll need 3 radio buttons and a normal push button to perform the shuffling action based on the radio button the user selected. To do this, in the onOpen function, we first need to get a reference to the documents’ UI environment object, from there we’ll invoke its showSideBar function. The showSideBar function in turn accepts a parameter of either an HtmlOutput or UiInstance object. We’ll create a new UiInstance. The buildUI function returns a UiInstance object. We first set the title of the sidebar by setting it in the setTitle function. We then create a hidden element called selectedRadioButton. This element will hold the name of the radio button the user selected. You create this element by calling the createHidden function of the UiInstance object. We then create three radio buttons and a push button, these buttons are created via the createRadioButon and createButton functions. Notice you can set the Id and text by using the setId and setText functions, respectively. This is the case with both the createHidden and createRadioButton functions. Since we want the elements to be shown underneath each other, we’ll add a Vertical Panel to the UI via the ceateVerticalPanel function and proceed to add the buttons to this panel. The last two things we need to do for our Google Docs add-on is to add server handlers in order to respond to when the button is clicked. The function that will be called when the user clicks on the button will be called shuffleIt. This is similar to events. All three radio buttons will call the same function when their values changed. This function will be called radioButtonsChange. The shuffleIt function in return will read the value inside the hidden element, called selectedRadio and based on this value call one of three methods. When the user selects to shuffle all paragraphs in the document, the shuffleParagraphs function will be called. The code above will get an array of all the paragraphs in the document, using the getParagraphs function of the Body object. The Body object is accessible via the Document object by invoking getBody. We then shuffle the array using the shuffle function and loop through all the paragraphs in the document and remove them. We then load copies of the shuffled paragraphs into a new array and append these copies to the document before removing the last original paragraph from the document. The shuffleSelectedText function, loops through the current selected elements in the document and determines whether it is paragraphs or text that was selected. This is done by checking the elements’ type by invoking the GetType function and comparing it to the ElementType enum, e.g. The function also checks whether the element is a partial selection, which means the user did not select an entire paragraph but only a part of it. This is done by checking the isPartial property of the element object. From there either the words or sentences are split based on a Regex match or simply a blank character, then loaded into an array and shuffled using the shuffle function. The original selection is then replaced with the newly shuffled text. Google Apps opens up a whole new world for MS Office developers to expand their product ranges to new customers across a wide range of devices. I am very interesting regarding view and editing Word document online. Platform like Google Doc are more fascinating on this are like most of developer trying to integrated with his/her app. I like to integrated my .Net web application to Google Doc but not fully understanding the terms and script to achieve this goal. My workflow is user click button to show document -> then server send this document to Google drive -> then, server open Google Doc with correct id and password-> if ok, Google doc will open that document recently send to google drive -> user can see the document -> user can edit and save it -> while close Google docs, server download back that document to server and delete that document at Google drive -> no document on Google drive ->that document has safely on server. Can you help me regarding matter, any help are promptly advance thanks you? From your .Net app you would probably have to use OAuth to allow the user to authenticate with their Google Drive account, from there you would be able to call the Google API’s. Thanks for the really useful demonstration of how to manipulate Google Document content. I’ve spent the last 2 weeks trying to solve a simple problem, and your above example provides some useful insight, but perhaps you can help me with one remaining key ingredient that still remains elusive to me: for Google Documents that have “Suggested Edits” in them, how might I programmatically (using Apps Scripts) accept all suggested edits (and remove all comments) and create a new google document with those accepted changes? Based on all the various approaches I have tried, I suspect that the above code manipulates the text as if all suggested edits were not incorporated. Am I correct in this thinking? Where are the suggested edits “buried” in Google Documents, and how can they be used to replace the test that they are supposed to replace, in a completely programmatic manner? I’m glad to hear the article were able to help you. From what it sound like, you’re pretty much there.